Crews of experts on Saturday began examining the damage to infrastructure and cultural monuments on the eastern Greek island of Kos after a powerful earthquake killed two tourists and injured nearly 500 others in the Aegean Sea region that stretches to Turkey’s sprawling coast. In Kos, churches, an old mosque, the port’s 14th-century castle and other old buildings suffered in the quake and were being checked by archaeologists and experts from Greece’s Culture Ministry. Hundreds of residents and tourists spent the night sleeping outdoors on the island, too afraid to return to their homes or hotels after the quake that struck in early Friday. Many camped out in parks and olive groves, or slept in their cars or on beach and swimming pool lounge chairs. The U.S. Geological Survey measured the quake as being of magnitude 6.7, with Greek and Turkish estimates a fraction lower. Two men, a Turk and a Swede, were killed when a collapsing wall smashed into a popular bar in the Old Town of Kos. The most seriously injured in Greece were airlifted to hospitals on the mainland and the southern island of Crete, and at least two were still in critical condition Saturday. The Turkish man’s parents were on the island Saturday making arrangements to repatriate his body home by boat, possibly on Sunday. Panagiotis Bekali, a 30-year-old who has lived on Kos for several years, spent the night sleeping in an olive grove with relatives while his 5-year-old son and 16-year-old nephew slept in the family car. Dozens of aftershocks have shaken the island, further rattling residents and tourists. John Grant, a 60-year-old tourist from Britain, said he felt safer sleeping outside. About 350 of the injuries occurred in Turkey, in Bodrum and other beach resorts, as people fled buildings and as the sea swell flung cars off the road and pushed boats ashore. Seismologists said the shallow depth of the undersea quake was to blame for the damage. In Kos, the quake damaged the island’s main port, so ferries were being diverted to the smaller port of Kefalos on the island’s southwestern coast. Serif Damadoglou Soukri, the imam of Kos, said the greatest damage to Kos mosques was sustained by the central 17th-century Defternatar Ibrahim Pasa mosque, whose minaret, restored a few years ago, collapsed completely. Ancient columns also toppled over in the southern part of the 2nd-century agora in the main town. Greek Orthodox Priest Vassilis Hlampanis said one of the damaged churches was repairable. “The greatest damage was sustained mainly in part of the sanctuary, in the middle part which fell, but there are also other sections around the external brickwork and certainly also internally,” he said. Kos Mayor Giorgos Kyritsis said island’s biggest infrastructure problem was the damage to the main port. Coast guard divers were on the scene inspecting the jetty. 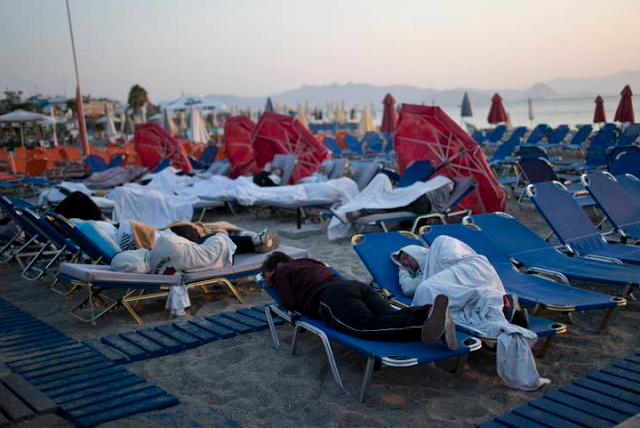 The mayor said Kos hadn’t seen many tourist booking cancellations as a result of the quake. “(Visitors) are touring the island with their tour guides. We don’t have a big problem. The ferry connection has been restored with the port of Kefalos and we are waiting as soon as possible to repair the damage at the port,” he said. Gift shop owner Giannis Manoutkos said life on the island had returned to normal. “Everything is normal now. The situation was bad for two days ... we are coming to a normal life again,” he said.